This fine portrait of Christopher Wren (1589-1659) is one of a series of portraits which usually hangs in the Deanery (currently under refurbishment) of some of the most renowned Deans of Windsor. This sitter is not to be confused with the architect Sir Christopher Wren, his highly celebrated second son and namesake.The younger Wren’s achievements and fame have eclipsed those of his forebear. This is unjust as Christopher Wren the elder was an eminent public figure in his day. The artist of the work is unknown but the quality of the painting suggests that he was a proficient portraitist. 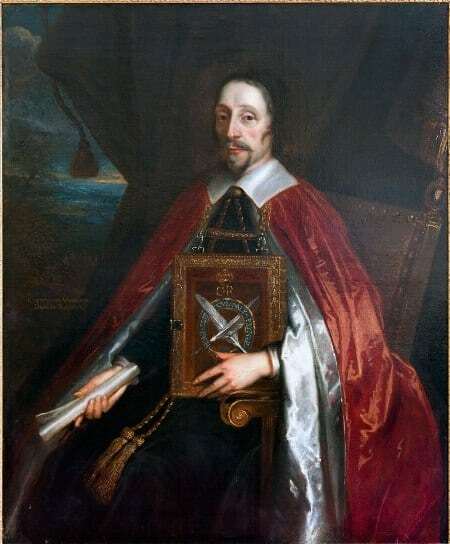 The work was painted during Wren’s years as Dean of Windsor which spanned from his appointment, interestingly to replace his brother Matthew Wren, on the 31st March 1635 to his death on 29th May 1659. Dean Christopher Wren is seated on a fine wooden chair the proportions of which have been distorted. This is often apparent in portraits as it enables the clearest possible view of the sitter’s robes and the items which he holds. The robe in question is a sumptuous crimson satin mantle typically worn by Garter officers. Although, the depth of the colour and the sheen the artist has created sets this image aside from some of its fellows in the Deanery. His delicately painted left hand supports a red book which bears the Register of the Garter’s badge. This register [subsequently known as the Red Book of the Garter], which must have been of considerable weight, is suspended from the Dean’s neck with gold embroidered straps. The painting gives a sense of the sitter’s pride in his office as Dean and Register of the Order of the Garter. His erect posture and the manner in which his left hand curls around the book drawing it to him, protecting and supporting it seem to confirm his commitment to the motto of the order inscribed on the book: “HONI SOIT QUI MAL Y PAYNSE [sic]” – ‘Shamed be he who thinks evil of it’. This image of confidence and commitment fits with what scant details exist about his time as Dean of Windsor. During the Parliamentarian occupation of Windsor Castle Wren refused to relinquish the keys to St George’s Chapel to Captain Fogg in an effort to protect the treasures and records of the Chapel and the Order of the Garter. His attempts were sadly unsuccessful and the treasury was plundered. However, through his subsequent efforts Wren was able to retain the registers of the Garter and the sword of the founder, although unsurprisingly not the lost silver. Although he did not reach the dizzying heights of architectural fame allotted to his son, Sir Christopher Wren, Dean Wren did also act as an architect during his lifetime. He designed country houses and redecorated the chancel at East Knoyle. Therefore, it is perhaps surprising that the painter has not chosen to represent any architectural elements in the background of the painting, a device that has been used in some of the other Deanery portraits. Instead he has opted for a heavy curtain, common in paintings of this era, and a simple landscape. The landscape gives the impression of a storm just at the point of lifting and we see the sun breaking through the clouds. This is a popular sentiment in ecclesiastical portraits due to the parallels with illumination, understanding and the light of God breaking through the darkness.